Introduction: Dengue virus is among the most widespread mosquito-borne human pathogens with 5 different serotypes. A ratio of 3 to 7 structural and non-structural proteins is retained by the 10.7 kb viral RNA genome. The Dengue virus NS5, a non-structural and most conserved protein in the genome plays vital role in virus replication machinery. The C-terminal RNA-dependent RNA polymerase (RdRp) domain of NS5 has been solved experimentally in the canonical right handed conformation that comprises of 3 sub-domains namely finger, palm and thumb. The presence of different structural characteristics portray that RdRp adopts various conformation strategies to fulfill functional modes. Methodology: To understand the molecular switches and signaling pattern that govern conformational functional features of NS5 RdRp domain, long-range dynamic by normal mode analysis coupled with comparative structure analysis and Insilico docking approaches were performed. Results: Our findings state that palm and finger are role playing and flexible sub-domains whereas the C-terminus region of motif B influence signal transmittance and substrate binding. Different motifs of RdRp are trivial in direct conformational transition except two C-terminal residues of motif B (L608 and T611) which modulate path signals. 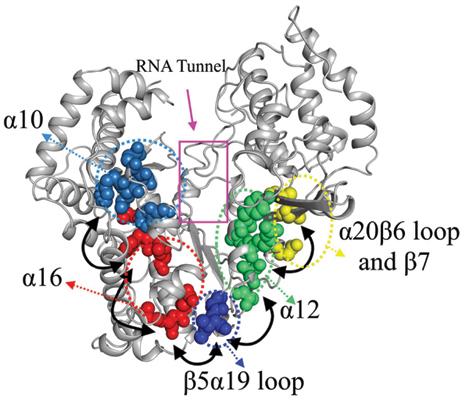 Signalling path indicates that dynamic clusters regulate RdRp allosteric pathway where α10 and α20β6 loop of the finger and thumb sub-domains act as terminals in both directions. Besides, the catalytic site, α16 connects and relay conformational signals to α12 through β5α19 loop. Conclusion: The occurrence of motif B in four dynamic clusters 1, 2, 6 and 7 strengthen our notion further corroborated that all motifs are trivial in direct conformational transition and motif B retains modulation of major conformation signals. Non-structured protein 5, RdRp, dengue virus, long-rang dynamics, allosteric pathways.